With 'The Hanging Tree' playing on repeat in the background, which it has been from the moment I returned from the cinema, I'm going to attempt to form some coherent thoughts on the third installment of 'The Hunger Games' franchise. Having been hesitant about the adaptation before it began, sat wearing my Mockingjay Pin in hope that it would include some of my own favourite scenes from the novel, within a few minutes of the opening credits I was already in love with the movie. And I was in complete support of the decision to split the novel in two. 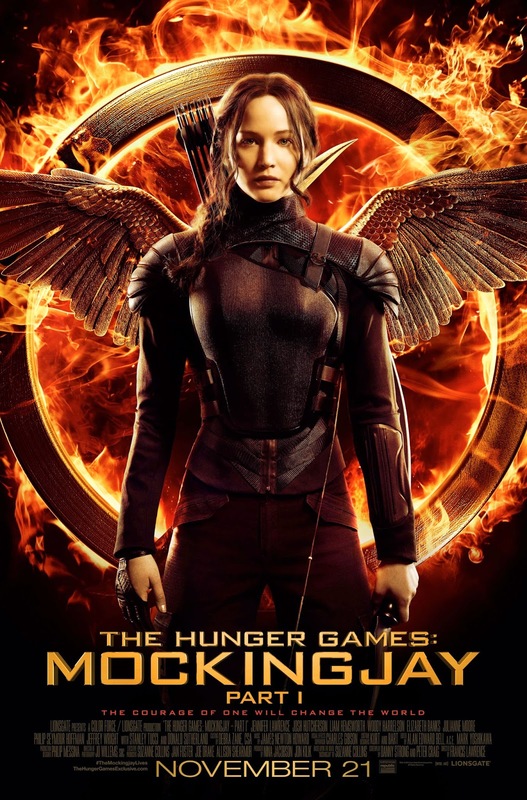 If you haven't see 'Mockingjay: Part 1' yet, you may want to come back later! This review contains spoilers! It's taken me a while, and a few illegible notes, to decide where I want to begin with this review. What I've realised is that 'Mockingjay: Part 1' took the most subtle details from a novel of over four hundred pages, even when an event may have been briefly mentioned in a sentence, and made them into a key element of this adaptation. It took the idea of propaganda, where Katniss becomes almost an advertising campaign for the rebellion, and designed the plot around it. A decision that the team behind the franchise should be applauded for. 'Mockingjay' showed what certain messages like those depicted in the District 13 broadcasts can lead to. Our main character's words have the ability to cause a huge reaction in Panem, triggering events that are only hinted at in the novel, since we remain with Katniss' point of view throughout the book series. What I loved about 'Mockingjay: Part 1' was how it allowed us to see what was taking place in the other districts; to really see the effect that the Mockingjay has on the people. When the Capitol's electric supply is taken-out; when the workers rebel in District 7; when those in the districts sing 'The Hanging Tree'. They all became promiment parts of the film. The filmmakers did cut from our protagonist's point-of-view throughout, but it brought Collins' whole world alive. I already want to go back and see it again. Katniss is, quite frankly, an entirely different person in 'Mockingjay'. Having competed in the Hunger Games twice, faced Snow's threats, and lost Peeta to the Capitol, it is no surprise that she is torn apart. Jennifer Lawrence had quite the task to portray this new-version of our main character, but from the opening description which was word-for-word perfect from the novel, she executed it brilliantly. She brought to life the raw emotions Katniss feels during the book, alternating between an extreme anger at the Capitol in the District 8 hospital(which made tears form in my eyes!) and the guilt that she feels over Peeta being captured, with ease. Each of the propos they set out to film resulted in a powerful scene from Lawrence, who - somehow - managed to add a hint of humour to the role at times. I can't quite describe how moving her scenes were, but the team behind the franchise created the perfect balance. The eerie silence that had it's hold over the cinema, nobody daring to even reach into a bag of popcorn - besides my mum - was forgotten for just a few moments. Making sure that Effie Trinket returned for this installment, even though the character is not featured in the novel, also managed to create a light-hearted atmosphere. Her reaction to life in District 13, without the eccentric outfit choices and luxuries of life in the Capitol, was a light-hearted sub-plot that I adored. Her scenes with Plutarch Heavensbee were priceless. I'll admit, when I first caught a glimpse at the character posters for 'Mockingjay', I was hesitant about who they had chosen to portray Coin. In fact, this was the case for almost all of the new additions to the cast. And, once again, I was proven wrong. Seeing Julianne Moore's take on the District 13 President - where those who had read the books couldn't help but sit in a smug silence, knowing what was to come - was one of my favourite aspects of the movie. Each time she was present on the screen she held my attention. Moore was a powerful presence, one that challenged even Lawrence's, making me both love and hate her character. I also Natalie Dormer's edgy portrayal of Cressida, and the rest of the propo team, who were all determined and driven to get the job done. This aspect had merely been something on the side in the novel, so it was great to see it featured so much. I couldn't write this review without mentioning the leading-men, and how much Josh Hutcheson as the hijacked Peeta scared me. It was frightening to see! There were changes made from page-to-screen, extra scenes from the districts across Panem edited into the movie, each improving on the book's content. Though, I would argue that this was still an adaptation that was made for the fans of the book. Having read multiple reviews from critics, it's clear that they could not look past the idea that there was no overthrowing of the Capitol or battle scenes taking place on the streets of Panem, all with Katniss centre-stage. For them, it's been merely a 'filler', whilst they await the release of the final fight-to-the-death style sequences. It was those who had read the books, or re-read multiple times, that noticed the attention to detail. The pearl that Katniss repeatedly fumbles with in her hands; the rope that Finnick clutches between his fingers; the roses that are found outside after the attack on District 13. Lines were taken, word-from-word for the book, and scenes were depicted as imagined. Those added scenes? They couldn't have been made better. Each built the tension, edited intricately into the movie, until it reaches a just about bearable cliff-hanger. Those working behind the camera on the editing really did tackle their role with skill. Do I dare say that it was better than the first half of the book? What did you think of 'Mockingjay: Part 1'? Do you think splitting the book was the right decision? I loved this movie, although Hanging Tree is still stuck in my head and annoying me at the moment. I agree with everything you said, Katniss being through so much and changing, the scenes and little details put together exceptionally. I do say this was better than the first half of the book, mainly because I didn't even like the third book that much. I had gotten 'The Hanging Tree' out of my head until I decided to reply to some blog comments! I can completely relate to your feelings on the third novel; it was definitely the weakest in the trilogy! It was heart breaking, wasn't it?! The only thing I'm wondering is how we will survive Part 2!